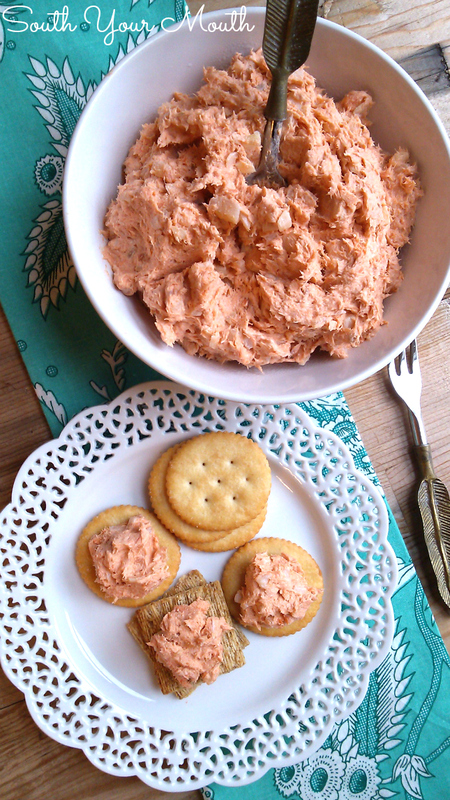 Easy smokey salmon spread, sometimes called a salmon ball, perfect to serve with crackers or crudité. So, I've spent the last two weeks thinking my appendix picked the worst possible day ever to try to kill me. Most of you know this but just in case you have no idea what I’m talking about, my appendix ruptured on Christmas Day and tried to take my colon out with it. But the more I think about, the timing could actually have been worse. It could have happened on Christmas Eve or a few days before. And if that would have happened then Santa would have been seriously impeded and Christmas would certainly have been ruined. As it was, the kids did get to wake up to a wonderful Christmas morning (at 4:50 a.m... ugh), Santa did come, all the food did get prepared and until approximately 11:00 a.m. when my innards reached critical mass, things went exactly the way they were supposed to. Even if I was blinded by pain. So, it really could have been worse. AND the timing is perfect to roll out this recipe. Since I know this recipe isn’t for everybody, I’m hoping you’ll feel sorry for me because of The Christmas My Appendix Tried to Kill Me and spare me all of the negative comments about how you don’t like canned salmon, how this looks like barf (yes, one of you actually said that – thanks again, pal), how you’re allergic to fish and so on and so forth. This is one of my very favorite spreads to make for parties! Mil (my mother-in-law) taught me how to make this. I add a little liquid smoke to mine but other than that, this is pretty much her recipe. I usually serve this with crackers but if you really want a special treat, serve these on cucumber rounds. They are beautiful (the green and salmon colors are so pretty together) and the crisp cucumber is such a nice contrast to the rich salmon spread. Cut two English cumbers into 1/4 inch slices then lay the slices out on paper towels for about 30 minutes to dry out a bit. Blot the tops of the cucumbers with dry paper towels (just to make sure there’s no moisture left or the salmon spread will slide right off of the suckers). Top each cucumber round with salmon spread then arrange on a platter. Boom. You uptown now, y’all. Beat cream cheese, Liquid Smoke, horseradish and salt with a wooden spoon (or with the paddle attachment of a stand mixer) until creamy and smooth. Drain salmon then remove and discard skin and bones. Stir salmon and onions into cream cheese mixture and mix until well combined. Add more salt, Liquid Smoke and/or horseradish to taste if desired. Spoon into a serving bowl then refrigerate spread until ready to serve. Sometimes I make a “salmon ball” by lining a round bowl with plastic wrap before adding the spread, refrigerating until firm then shaping it into a perfect ball when I’m ready to serve. Serve with crackers or crudité. *It really has to be red salmon. It’s more expensive but it’s SO much better. Spend the extra $2-$3 for the red salmon. If you can’t find it (some grocers only carry the pink salmon), you can still use the pink but I promise the red is noticeably better. And by all means, if you have fresh cooked salmon, go right ahead and use it! Shared at the Weekend Potluck! Yum! I love the idea of liquid smoke and horseradish with the salmon. Why on earth would someone bother telling you they were allergic to fish? "Oh, ok, I won't post any fish recipes then!" People are weird. This looks delicious Mandy, I am going to try it! So sorry about your appendix on Christmas Day, OMG. This looks yummy. I wonder if finely sliced green onion can be used? 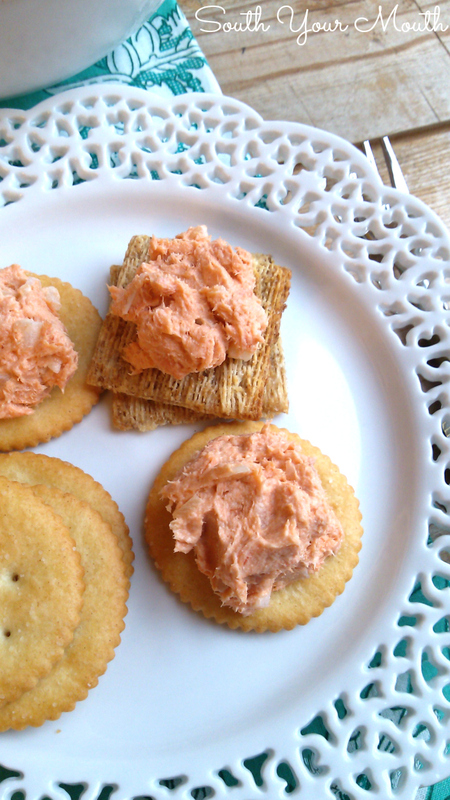 The green onion mixed with the red salmon spread would look pretty too!!! I am so sorry to hear about your appendix! I hope that you are doing much better now!!! This Salmon looks Wonderful. I can not wait to try this one very soon. Well, what a Christmas you had...shame on your appendix !! I hope you are feeling better. We love salmon at my house! I do have a question for you though. Do have to use horseradish or could you use something else? yum cant wait to try this! I don't think I have ever tried a Salmon spread before. Hubby is going Salmon fishing this month, so I think I'm going to try and make this to try it out! So, your seafood recipe was floating around on Facebook, and I just happened to click it... boy am I glad I did! We share such similar food tastes! Keep up with the awesome recipes!!! I can't wait to spread this on an everything bagel! I hope I can find some of the mini everything bagels to turn this into an app. Thanks!